The Net Usage Project is aimed at providing internet usage indicators for the Firefox browser. It works by fetching numbers from an XML feed or usage web page provided by the ISP. This project is targetted towards Australian Broadband Users whose broadband connections are encumbered with download (and sometimes upload) limits. However, this meter can be adapted for any country's ISP who provides a XML usage data feed. First, right click on the toolbar and click Customize.... In the customize dialog, find the Net Usage Item and drag it on to a convenient location on your toolbar. Right-click on the Net Usage Item and select Preferences. In the Preference dialog, select your ISP and fill in the details. After saving the preferences, click on the Net Usage Item once to update your internet usage. Parsing errors occur when net usage tries to access the usage web page of your ISP but found something it did not expect. Please first manually visit your ISP's usage page. In some cases, the usage page maybe show a message indicated that it is in maintanence or a form requiring you to confirm your details. If you get a parsing error, go to the settings page and click the 'Send Debug Information' button. Please provide any additional information in the pop up box. When I open firefox, usage bar displays full offpeak/onpeak usage and a cross. It is likely that other [buggy] Firefox extensions are interfering. Try disabling all the other extensions one by one to work which extension is causing the problem and inform the author of that extension. Your firefox profile is likely to be corrupted. Please try to run Firefox in Safe Mode by opening Firefox using the safe mode shortcut in your start menu Mozilla Firefox program group. If that fails, please backup your bookmarks and create a fresh new profile. Close firefox then try and delete these three files from your firefox profile folder: extensions.ini extensions.cache extensions.rdf Restart firefox afterwards try to install again. Netusage uses Firefox's Password Manger to save the username and password. Check that you haven't cleared your saved passwords when you exit firefox. Otherwise, your firefox profile is likely to be corrupted. Please try to run Firefox in Safe Mode by opening Firefox using the safe mode shortcut in your start menu Mozilla Firefox program group. If that fails, please backup your bookmarks and create a fresh new profile. I use a master password and netusage doesn't update on startup. The net usage history database is corrupted. You have to close Firefox and delete the netusage.sqlite file in your Firefox profile folder. It seems like your firefox passwords database is corrupted. Please close firefox, then go to your firefox folder, search for signons.txt or signons2.txt etc and delete or move these files away. Then try to set your preferences again. Failing that, you might need to start a fresh new firefox profile. What does the green bar represent? The green bar is the amount of [peak] data you have consumed for the month. It progresses from left to right as more data gets used up. What is the black triangular arrow on the usage bar? Here's what the black triangle is: Basically, the triangular arrow shows the day of month. It progresses in a constant rate, from left to right. If your usage month starts on the 1st, ends on the 30th and it's the 15th, the triangular arrow will be exactly in the middle. Using the triangular arrow you can manage your usage by downloading at the same rate as the arrow. 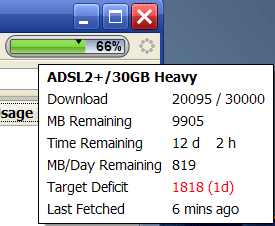 So if the green bar and arrow line up, you know you are using the download at a sustainable rate. If the arrow is way behind the green bar, you know that you will exceed your quota if you continue at this pace. The target surplus/deficit is basically an indicator which allows you to manage your download evenly across your usage month. A surplus means you're conserving your download. A deficit means that your past download rate is unsustainable and you will probably breach your quota if you continue at this rate. Technically, it is the amount of data (and days) between the green bar and the black arrow on the usage bar. In other words, it tells you how much you've downloaded compared to your target (calculated by [total quota]/[days in month]*[day number of today in your usage cycle]) in the billing month. Eg, if your monthly quota is 300MB, in a 30 day month, and this is your 6th day, your target will be 300/30*6 = 60MB. If you happen to have only downloaded 50MB, the target surplus will be 10MB. Conversely, if you happen to use more than 80MB, then you'll have a target deficit of 20 MB. 1) You've been on holidays and haven't been using the net. You come back and find you can download a lot, but you don't want to download too much that you leave very little for the rest of the month. You can look at the target surplus, which will tell you if the 700 MB file you want to download will blow your target. 2) You've been downloading too much, and the target deficit is big. You want to use as little of the net as possible for a few days, but you want to know when you can use it normally again. The target allowance will tell you in how many days (figure in the brackets) of minimal use you have to endure until you are back on target. The new version now allows for a custom display text. Access it via the Display Text context menu, last option: Custom. In the box that pops up, you can specify any crazy format combination i.e. If you've enjoy using the Net Usage extension and want to encourage me to keep improving it, please consider donating. Thanks!